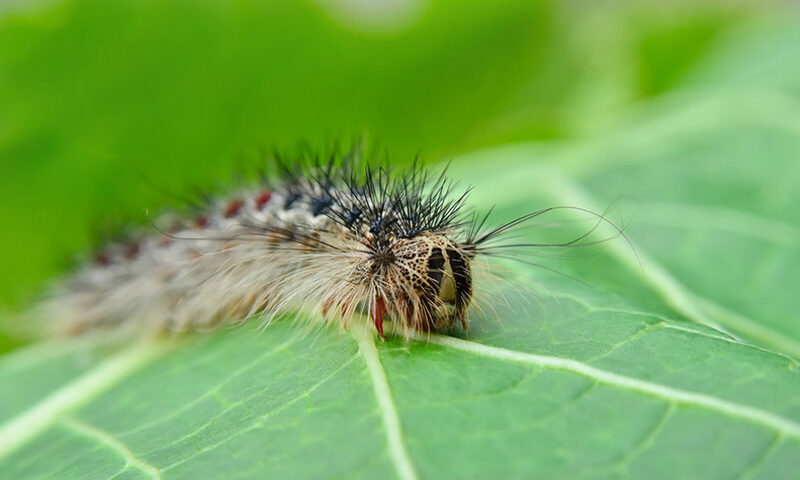 Pike County worked with the PA Department of Conservation and Natural Resources Bureau of Forestry in a joint effort to spray for Gypsy Moth caterpillars in Pike County in late May. Scheduling of spraying was based on development of the caterpillar’s preferred food – oak tree leaves- and the development of the caterpillar itself. This spring development of oak leaves, especially white oak, somewhat slowed the process. The insecticide was applied by aircraft, either helicopter or fixed wing, flying approximately 50 feet above the treetops. Residents should be aware of common sense precautions to take if they are in a treatment area during spraying. Remain under cover during spraying. To avoid the possibility of eye irritation, persons should not look up as the spray droplets are descending. If eye irritation does occur, and eye wash should be used and the family physician consulted. If the material gets on the skin, soap and water are sufficient to remove it. To make spot removal as easy as possible, vehicles which are exposed to the spray deposit should be washed as soon as possible. If the deposit has dried, soaking a towel with a car wash soap and water will rehydrate the Bt and can then be removed by wiping with a towel or cloth.